You may want to Setup and use VPN on your Android Phone to download Apps that are not available in your Country, use public WiFi without risks or for various other reasons. 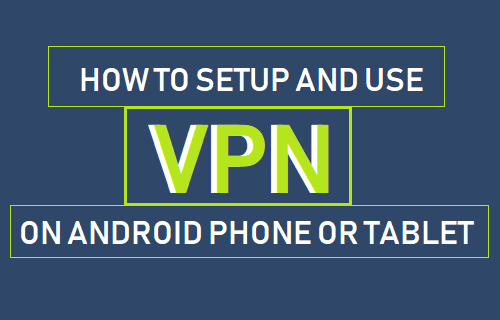 You will find below the steps to Setup VPN on Android Phone or Tablet. The easiest way to setup and use VPN on Android Phone or tablet is to download Free or Paid VPN Apps as available on Google Play Store. These Apps are designed to automatically setup VPN network on your Android device and you do not have to bother about things like knowing VPN Server Address, selecting VPN Type and providing other details. 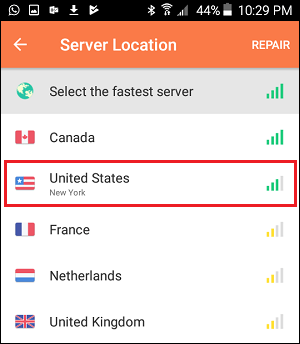 However, if your VPN Service does not provide an App or you want to have more control over how VPN network, you can manually Setup VPN by using Settings on your Android Phone or Tablet. To provide you with an idea about how to setup and use VPN on Android Phone, we are providing below three methods to setup VPN on Android Phone or Tablet. 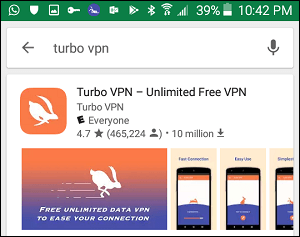 One of the best free VPN Apps that you can find on Google Play Store is Turbo VPN, which offers unlimited Free VPN service. Although, Turbo VPN App covers only a limited number of countries, it covers the most popular countries that most users would be interested in. Open Google Play Store on your Android Phone or Tablet and download Turbo VPN App. Once the App has finished downloading, open the app and tap on the World icon from the top right corner of your screen. On the next screen, tap on the Country in which you want to use Turbo VPN. Wait for the App to connect to the selected Country’s VPN network. If you get an error message, try connecting to the VPN network again. Once you are connected to the VPN network, you will be able to download Apps available in other Countries by changing Google Play Store Country on your Android device. 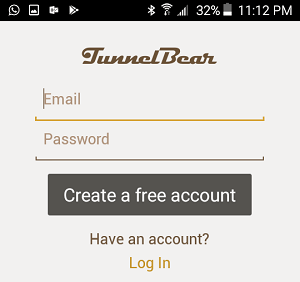 TunnelBear VPN is another VPN App that you can consider downloading from Google Play Store. TunnelBear VPN provides a much bigger selection of Countries and allows you to try the App on a free-trial basis, before making a decision to purchase the App. 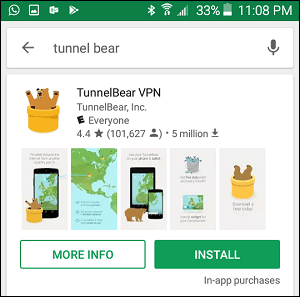 Open the Google Play Store on your Android Phone or Tablet and download TunnelBear VPN App on your device. Once the App is downloaded, open the App and create your Free VPN Account by typing your Email Address, a Password to login to your VPN and tapping on Create a free account button. 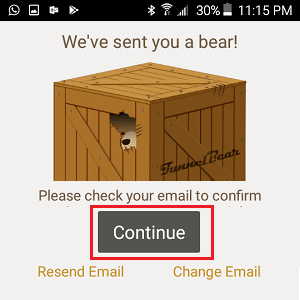 The next step is to verify your Email Address by logging into your Email Account and acknowledging the Email received from TunnelBear. After verifying your Email Address, open the app and tap on the Continue button. 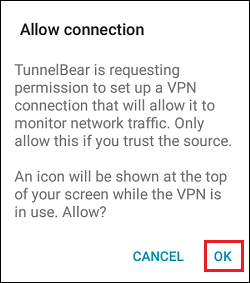 On the next screen, move the Toggle button to ON position, in order to provide TunnelBear with permission to setup a VPN connection on your device. By default, TunnelBear App connects users to its VPN network in the United States. You can change the location by tapping on the Up Arrow located next to United States and select your desired Country from the list. The free trail of TunnelBear VPN provides 500 MB, after which you can extend the free trial for 1 GB more by tweeting about TunnelBear, inviting a friend to TunnelBear or by installing TunnelBear on your computer. Paid plans for TunnelBear VPN are not expensive, starting at an affordable $5 per month. 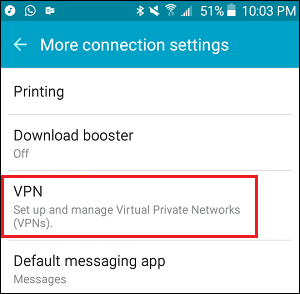 If you do not want to install VPN Apps, you can setup VPN on Android Phone using your phone’s settings. 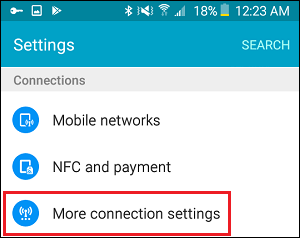 Open Settings on your Android Phone or Tablet and tap on More (may also appear as More Connection settings) located under Networks (or Connections) section. 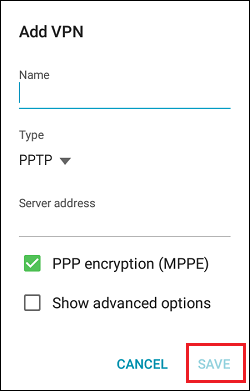 On the pop-up, type a Name for your VPN, select VPN Type and type the IP Address of your VPN in Server address field and tap on Save. After this you will be able to browse the internet using VPN connection. You will be required to provide your User Name and Password, in order to connect to your VPN network.